Find out the trends of returns shown by different investment alternatives in the past 36 years. 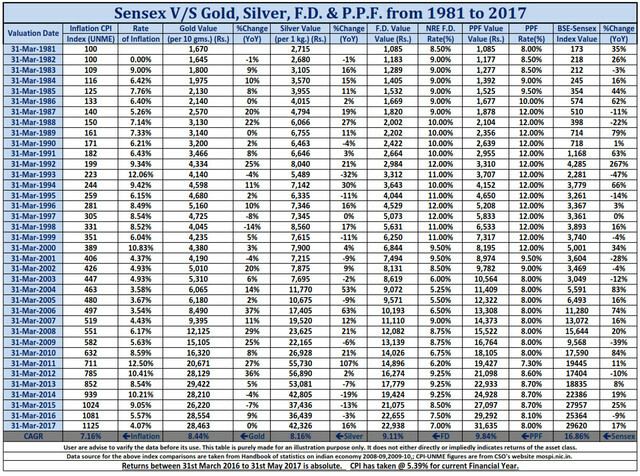 Comparing the return stream of Gold, Silver, FD, PPF and Equity Market against the prevailing inflation rate, Equity Market instruments have proved to be the most remunerative and rewarding investment option. There is an infinite collection of investment options available in the fiscal emporium. But, selecting the appropriate option is a bit tricky, and when it comes to investing a huge chunk, it becomes even more critical. Approaching a financial expert is often cumbersome, and you are left in the plight of making a legitimate choice to quench your investment thirst. So, what should one do? Worry not, as we have done the legwork for you. Let’s glide along the article and dig out what possible investment options are waiting out to let your money grow. But before we move further, let’s first unravel the term ‘Inflation’, which is one of the most important peripherals of the financial market, to get a better hold on investment strategies. Inflation is the rate at which the generic price for goods and services climbs which consequently trims the purchasing power of the currency. In order to achieve equilibrium in the economy, the Central Bank attempts to limit inflation, and along with that curbs deflation by applying various economic tools and methods. Before proceeding with the investments, it is crucial to have an insight of the financial market, the past returns record, and the possible rewards that the schemes will bestow in the future. With a careful study and critical reconnaissance of the following data chart, numerous observations can be penned down for the purpose of shepherding towards the most appropriate investment option. The rate of inflation has been floating between the range of 6-13% over the course of 36 years, wherein the maximum was at 12.50% in the year ended 31-03-2011. The current inflation rate is 7.5%. For considering a viable investment, it has to be assured that the return which it yields ought to be higher than the prevailing inflation in that year; else, you may end up losing the worth of your invested capital. Witnessing the reward stream of Gold, we can identify that the returns have constantly been fluctuating at a striking rate which might be used by the high risk-taking investors to cultivate greater returns. But, as seen from the chart showing data in the past few years, the returns have halted at the negative frontier which is quite unfavourable and thus, puts up a very important question- Should Gold be considered as a viable option to park your funds? Eyeing on Silver, we find that although it has given a lucrative return of 107% in the year ended 31-03-2011, the reward stream is pretty bumpy. Moreover, from the past five years, it has constantly been sucking up the principal and giving out negative returns. Talking about the fixed income investment options like Fixed Deposits (FDs) and Public Provident Fund (PPF) which have elongated lock-in period, the returns are steady. However, there is an absenteeism of easy liquidity, and the growth prospect is not widely attainable due to which the returns remain constant and hardly escalate. Moreover, there has been a gradual decline in the return stream over the past 4-5 years and has even drifted under the inflation rate in some cases. The investments in the growth-oriented asset class, i.e., in the Equity Market, envisage a basket of benefits over the other investment modes. Although the growth prospects are vibrant and the returns are steep in tandem with risk hike, they can be curbed by adopting sterling investment strategies. Getting a load of the graph, we can depict that these instruments provide fat returns as compared to the grim returns provided by mundane investment instruments like Gold, Silver, FD, PPF, etc. Also, the CAGR of equity is around 16% has surpassed more than twice the rate of inflation whereas, other instruments have merely touched the inflation mast. From the above analysis, a modest conclusion can be drawn which highlights equity class as the best investment option for long-term investors who are desirous of attaining capital growth and wealth creation over the long run. However, it’s not possible for an average investor to cherry-pick the best investment strategy with his/her limited access to knowledge and thus, the need to rely on a good financial advisor creeps in. The asset management companies have a holistic familiarity and fine sense of judgment of the financial market. They hold the highest degree of reliance as they disburse the money of the investors in a varied range of instruments which yield maximum returns with controlled exposure to risk. This is done by channelising the large pool of money in diversified portfolios that trims the magnitude of overall risk. Systematic Investment Plan (SIP), wherein a periodic investment of predefined amount is made. It is the best way to deal with the day to day volatility and suitable for those who are purely risk-averse but expect the disciplined amount of returns over the course of considerable years. MySIPonline provides you with the platform to initiate your journey towards equity mutual fund investments by following the hassle-free online process. You must begin right away to fetch the maximum returns in the future.